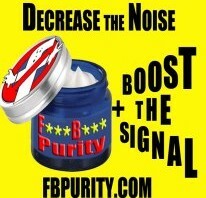 ← New method for evading Facebook’s ads – Use F.B Purity to view the Friends Feed without any ads! This version means a big change for Firefox v48+ users and also for Chrome users. I have converted the FBP FF extension to use a new Firefox extension API, that is compatible with Firefox’s new “Electrolysis” (multi process architecture) feature. This should mean the new version will run more efficiently, and will also mean a few bugs caused by the old extension compiler will be eliminated. If you already have a version of the FBP FF extension installed and are using FF48 or above, you will need to export your settings from that version, via the “Export Settings” link at the bottom of the FBP options screen, then disable and or uninstall your current version of FBP, before you install this new version, as it has a new internal ID, which means if you try to install this version without disabling or uninstalling the previous version, you will then have 2 separate versions of FBP running at the same time, which will cause lots of problems. As you may know Facebook forced Google to remove the Chrome extension version of FBP from the Google Chrome Webstore, over a claimed Trademark infringement, which led to the necessity for the awkward and flaky drag and drop install process for the stable version of FBP. Despite me fixing any issues Facebook had with the extension they are not playing ball and are not allowing the original version of the chrome extension back into the webstore. Unfortunately a scammer has seized the opportunity to take advantage of this situation by uploading 3 fake copies of F.B. Purity to the webstore. The fake versions all have “FB-Purity .Net” in the title. Those versions of FBP are illegal, unsafe and not to be trusted. If you have installed a version of FBP via the Chrome Webstore that has “FB-Purity .Net” in the title, I strongly advise you to uninstall it immediately. I have contacted Google numerous times to try and get them to remove the fake copies but they are not doing anything, this is extremely frustrating, I will continue to work to get them removed, but its an uphill battle, if you have any suggestions or know anyone at Google who could help with this, please get in touch, thanks. In the meantime I have created a new version of the FBP Chrome extension with a new internal ID, and uploaded that to the Webstore. Before updating to the new version of the Chrome extension, you need to Export your existing FBP settings via the “Export Settings” link at the bottom of the FBP options screen, then disable or uninstall FBP on the Chrome extensions management page. Its probably better to uninstall it as it will be less confusing that way. Once you have done that, go to the Install page at INSTALL.FBPURITY.COM and then click the green “Install F.B. Purity” button to install the new version of FBP (v16). The “Inline Install” system should now work again, which means the “one click” install method is back again, and also means the FBP chrome extension will autoupdate, either on its own when no facebook pages are open, or when you click the “Developer Options” checkbox and then click the “Update Extensions Now” button on the Chrome Extensions management page, when i release new versions of the FBP chrome extension in future. What’s Changed in FBP v16.0.0? New: Filter photos by image content options (the new options are under the “Photo Stories” heading on the FBP options screen) This functionality relies on Facebook’s internal Artificial Intelligence image recognition system, so it can only filter images by subject if Facebook’s AI has been able to determine what the image contains, sometimes it will not work as it has not detected any computer recognisable objects in the image, and sometimes it will mis-classify objects in an image, image recognition by computers is a very hard problem to solve, but its getting better all the time. To re-iterate FBP is only filtering images based on the things Facebook’s AI has detected in the images, so this functionality should work most of the time, but it will miss some images where Facebook has not been able to identify the image correctly. 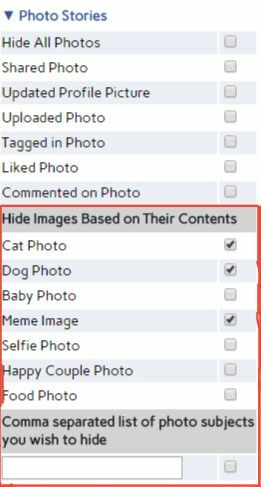 I have included some example subjects some people may want to filter; Cats, Dogs, Selfies, Memes, Babies, Happy Couples, Food and have also included a free text box where you can put a comma separated list of custom subjects that you want to be filtered out. 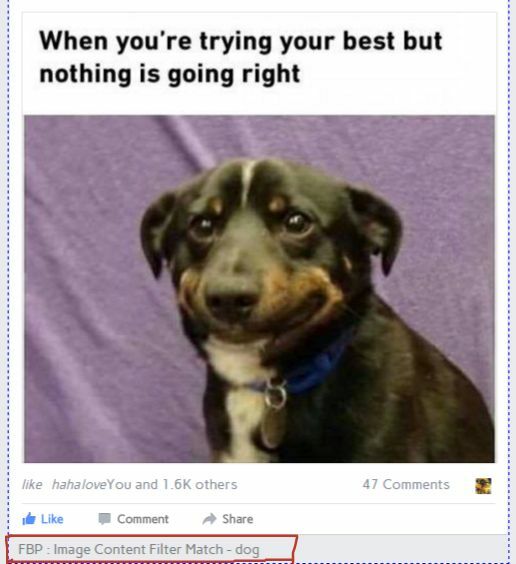 Please note the AI does not currently recognise particular people, like celebrities or politicians, so you will not be able to use this functionality to filter out pictures of Trump or Kanye etc, though you should be able to filter a lot of those out via FBP’s separate”Text Filter” function. Screenshot showing F.B. Purity’s image content filtering functionality in action. New: You can now choose from a selection of Custom Reactions image packs right on the FBP options screen, so theres no need to copy and paste the image Urls any more. This makes the process of setting custom reactions much simpler now. New: Option to hide the “Cookies policy” bar (option is under the “Top Nav Bar Options” heading. Fixed: “News Sort: Most Recent” – This option had stopped working for some people, that should be fixed now. Fixed: Facebook “View Live Grid” functionality on https://facebook.com/live that shows the faces of the a large number of the people who are currently live. Fixed: The “Clear Ad-prefs” functionality is fixed on the https://www.facebook.com/ads/preferences/?entry_product=ad_settings_screen . If you have a large number of interest categories on your ad prefs page, you may need to run the ad prefs cleaning function a number of times and reload the page between each sweep. I will work on getting this working better, but its better than nothing for now. Its hard to test this as they don’t seem to have included a way to manually add new Interests. Let me know how the new functionality works for you. Due to a facebook code change, that facebook is testing on some people, those people are having an issue with the left column disappearing on Group pages if the “freeze left column” option is selected. If that issue affects you, just turn that option off. A lot of people are wondering how to hide the “Page stories you might like” box, at present I have not figured out a method to hide this. I am not actually getting that box on my account at present, which makes it difficult to code a fix for it. In certain circumstances the “Export Settings” link will not work on the Chrome extension version of FBP. A workaround for this, is after clicking the “Export Settings” link, click the FBP options screen’s “Save and Close” button, that should trigger the “Export Settings” save dialog to open up. FBP TIP: Always keep a backup of your FBP settings. You can do this by clicking the “Export Settings” link at the bottom of the FBP Options screen. You should do this in case your settings somehow get wiped, or you want to transfer to using a different browser/different computer. Or want to experiment with resetting your settings to troubleshoot a problem. For those who don’t already know, FB Purity is a safe, free and top rated web browser extension for Google Chrome, Firefox, Edge, Safari, Opera and Maxthon. It lets you clean up the junk and customize Facebook the way you want it to be. It has many cool features, such as hiding all the ads, alerting you when friends un-friend you, letting you change the site’s colours, fonts and background image, it lets you stay on the “Most Recent” feed permanently and lots more. FBP has been reviewed and highly recommended in many places including the Washington Post, CNET, PCWorld, MacWorld, GetConnected etc. This entry was posted in Facebook, FB Purity and tagged baby filter, block all facebook ads, block facebook ads, cat filter, clean up facebook, Customize Facebook, dog filter, F.B. Purity, Facebook, facebook baby filter, facebook cat filter, facebook image filter, facebook meme filter, facebook purity, FB Purity, filter out cats, filter out memes, filtering by image contents, fluff busting purity, hide all facebook ads, hide facebook ads, hide sponsored posts, hide sponsored stories, hide suggested posts, image content filter, image content filtering, image filtering, meme filter, remove all facebook ads, remove facebook ads. Bookmark the permalink. 23 Responses to F.B. Purity v16.0 – Lets you filter photos by the contents of the photos. Thanks for your ongoing work on this project. It’s appreciated, shame that Google are being so hard to deal with re: the fakes in the Chrome Store. I have searched all over my Firefox, and cannot find the screen you are talking about. How do I find the FBP options screen in Firefox? Firstly you need to make sure you install FBP via http://install.fbpurity.com as the version on the mozilla add-ons page is out of date. second of all, you should read the User Guide page on FBPURITY.COM http://user-guide.fbpurity.com to learn how FB Purity works, as everything is explained there. I think this addition will have a great safety mechanism for parents to use with children related to adult-content photos as well as those of us who just don’t care to see naked whatevers. I also wait with anxious hopes that the ability for the app to recognize celebs that are sickening to some of us and we would love to block. (ie: Kim Karda…..Justin Be…..) Their trivial lives slap people in the face who are facing true life challenges. i don’t know whether facebook’s image classification system can recognise adult content. BTW as mentioned in the post above, you can block most trump or other “celebrity” related posts using FBP’s “Text Filter” function, just put the names of the people you dont want to see in posts in the newsfeed, into the “Text Filter” box on the FBP options screen. Yes, that is the genuine version of FB Purity. I had to re-upload it because Facebook forced Google to remove the original one over a claimed Trademark dispute. Hi, having problems with FBP since Firefox auto-updated to version 49.0.1. Basically FBP has completely stopped working. I uninstalled it and then reinstalled it, but no dice, just not working at all. Any suggestions? can you block minion photos? you can only use the image content filter to block images that facebook’s artificial intelligence image classification system recognises, i do not believe minions is one of those things. Facebook’s image classification system is quite limited, as is its just a computer program running, it cant recognise and describe things as easily as humans can. Most minions images include text, so you could use the “hide meme images” filter to filter them out, though it would also filter any other images that include a text message in them too. THANK YOU! For all that you do. When I recommend FB Purity to friends, my tag line is that if Facebook is going to this much trouble to suppress it, then it *must* be working remarkably well to get rid of pesky ads and such. Indeed, when I go on Facebook from work, where we don’t get the luxury of your software, I can see the major difference. I don’t know how people tolerate Facebook without cleanup software. Would it help you if us little people also write to Google and Facebook in support of FB Purity? thanks for the support! writing to facebook and google could help i guess, though its incredibly hard to get through to corporations of their size. Not sure what the story is, but Firefox 51.0.1 (32-bit) does not provide an Options button for FB Purity. So, unless I missed something, it’s not possible to export settings before uninstalling. Not an issue for me. I just uninstalled the old version, installed the new and recreated my settings from scratch. I just thought you should be aware of the disconnect between the instructions and the way Firefox now seems to work. I had FBPurity and then it disappeared a few months ago. I want to install the new version. I looked in the Control Panel under programs and I’m not finding it listed there. Is it safe to assume it’s not there and install the new version? I miss it!